One of the five people indicted for a drug transaction that ended with a shooting at Urbana University pleaded guilty to drug trafficking charges in the Champaign County Common Pleas Court. 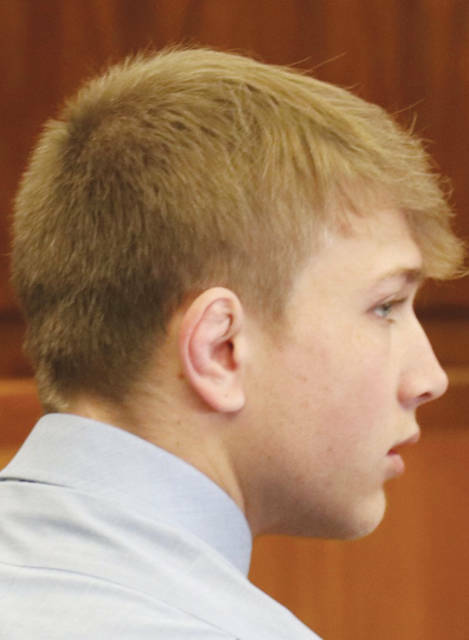 Hunter Donnan, 18, pleaded guilty to two counts of trafficking in marijuana, fourth-degree felonies, during a hearing on Friday. A sentencing hearing is scheduled for Feb. 20. The Nov. 6, 2018, incident resulted in the university placed on lockdown. A court statement previously filed in the Champaign County Municipal Court states an investigation showed Ryon W. Lucas, a student at Urbana University, made arrangements for Donnan, also an Urbana University student, to deliver and sell over 200 grams of marijuana to him in Sycamore Hall. During Friday’s hearing, Champaign County Prosecutor Kevin Talebi said Donnan, Brandon J. Craft and Ryan M. Rowland drove to Urbana University to sell the marijuana. When Donnan and Craft entered the room, the drugs were shown to Lucas by Craft. The investigation showed Lucas intended to steal the drugs from Donnan and Craft. An associate of Lucas, who was in the room with him during the attempted drug deal, brandished a handgun and struck Donnan in the head with the gun. Craft had a loaded .22 caliber revolver in his waistband while completing the drug transaction. When he observed Donnan get hit, Craft started to pull his revolver from his waistline. Lucas’ associate then struck Craft in the head two times, causing Craft to drop his revolver. When Lucas’ associate struck Craft in the head with the handgun, the gun fired. Everyone in the room ran from the room and left the campus. Urbana Police were dispatched to the campus in reference to a male running from campus across South High Street. Donnan and Craft both received injuries to their heads from being struck with the handgun, but no one was struck by the bullet that was fired from the gun. As part of his plea, one-year and three-year firearm specifications were dismissed from one of the trafficking in marijuana charges against Donnan. Judge Nick Selvaggio ordered Donnan to continue residing at his residence while observing a curfew between 11 p.m. and 7 a.m. and have no contact with his co-defendants or Urbana University as part of his bond. On Thursday, Lucas, 21, pleaded not guilty to two counts of felonious assault with one-year and three-year firearm specifications, and one count each of aggravated robbery with one-year and three-year firearm specifications and tampering with evidence. A case scheduling conference in his case is scheduled for Feb. 4. Craft, 18, is charged with one count each of trafficking in marijuana with one-year and three-year firearm specifications and a specification for forfeiture of property and carrying a concealed weapon with a specification for forfeiture of property. On Thursday, he was found indigent by the court and his arraignment hearing will continue Monday. Rowland, 20, is charged with one count of trafficking in marijuana with one-year and three-year firearm specifications. On Thursday, he informed the court he would retain his own legal representation and his arraignment hearing will continue on Feb. 5. Dioro C. Geroski Jr., 22, was also indicted on two counts of felonious assault with one-year and three-year firearm specifications and aggravated robbery with one-year and three-year firearm specifications. The grand jury indictment contends Geroski was the individual who struck Donnan and Craft with a gun.